I will be the first to say that Husain Qutbuddin (HQ) and his siblings are intelligent. This is why their ignorance of select aspects of Dawat texts is all the more striking. Despite claims of Ilme Aale Mohammed SA and worldly knowledge, they fail to understand the most fundamental of Dawat principles, to recognise relevant precedents in Dawat history, and to comprehend simple reasoning and logic. This indicates that their abandoning of haqq has in turn led to Dawat texts and intellect abandoning them. Syedna Mohammed Ezzuddin RA then goes on to inform Syedna Tayyib Zainuddin RA that he has authored a document in which he has named him as his mansoos and has placed this document in a basket which he then pointed towards. Syedna Mohammed Ezzuddin RA then began speaking about something else. This is the manner by which Syedna Tayyib Zainuddin RA describes the incident in which he first learns of the nass upon him: ‘and one night’. If HQ believes that the narration of nass communicated by Syedna Mufaddal Saifuddin TUS is susceptible to doubt, then he also doubts the nass narration given by Syedna Zainuddin RA. Syedna Zainuddin RA goes on to describe how this kitaab was the kitaab of nass upon him. It is interesting, nay providential, to mark that the manner by which Syedna Ezzuddin RA informs Syedna Zainuddin RA of his nass upon him, mirrors the manner in which Syedna Burhanuddin RA informed Syedna Saifuddin TUS of the same. If the evidence regarding the nass upon Syedna Mufaddal Saifuddin TUS was fabricated, or as HQ states, made up only a few days before it was released, it would only be logical that a date be included. Contrary to what HQ claims, there would have been no way for anyone to verify whether or not a private conversation took place between Syedna Burhanuddin RA and one of his sons on a specific date, following verification that Syedna al-Muqaddas RA was in Mumbai on the said date. HQ should know this; his father’s entire claim to the mantle of Dawat rests on a ‘private conversation’. If an individual was asked where he was and what he was doing on a random date, like July 27th, 2012, more than likely he would have difficulty remembering. However, if he was asked what he was doing on the day of the opening ceremony of the London Olympics, there is a better chance that he would be able to recall his location and actions. Events are normally described and recollected more through context then dates. Syedna Saifuddin TUS helped his audience contextualize this significant event by providing the following details: (1) This event took place 4 or 5 years ago, (2) Moulana Burhanuddin RA na mizaaj mubarak par giraani thi, (3) work was being carried out in the khazaanah, (4) the document was kept in Saifee Mahal in Syedna Taher Saifuddin’s RA room, in a teak cupboard, along with other private possessions and (5) only Syedna Burhanuddin RA could access it. The above contextualisation would place this event as having taken place in either 1430 H or 1431 H. However, out of these two years Maula na mizaaj mubarak par giraani was in 1430 H, which was the one year in which he did not make a public appearance on the occasion of his Milad Mubarak. Reference to the khazaanah (Moula’s personal library) narrows down the period in question to the couple of months when work was going on in the khazaanah in Saify Mahal. Questioning the event during which someone learns of the existence of an historical document does not negate the existence of said document. The fact remains, that the document exists and its age and authenticity can be ascertained very easily. HQ’s attempt to deny the fact that this event ever took place by insisting upon a date indicates the desperate levels to which they have fallen to in their attempts to cast doubt on the authenticity of a document they never knew existed, and have now dismissed without examination. Caught off-guard by the existence of the nass document, KQ on the 4th of Rabi al-Akhar adds to his fabrications by claiming that Syedna Burhanuddin RA reiterated nass upon him multiple times even after 1388 H. He says “ehna pachi to mane Moulana ye haji kitni waar farmayu che ke mara waaris tame cho’’ (Moulana has repeatedly told me [after 1388] that I am his successor. It is strange that in all of his official statements and bayaans he never mentions these other incidents of nass, until he learned of the existence of this nass document. If he remembers his so-called nass from 50 years ago so well, why hasn’t he shared these other instances with the community which would have occurred in more recent memory? Isn’t he concerned about strengthening our conviction regarding his claim? HQ should not get too caught up in dates. 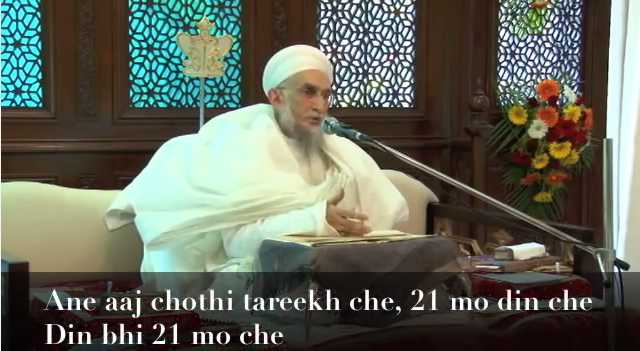 In his 4th Rabi al-Akhar YouTube bayaan, his father insists that it has been 21 days since the wafaat of Syedna Burhanuddin RA and parades this as being a ‘blessed coincidence’. In actuality, there had been only 19 days between the wafaat of Syedna Burhanuddin RA and Imam al-Zaman’s AS Milad Mubarak. KQ either believes he was telling the truth or that he was lying. If he believes it was the truth, then he and his children, despite their PhDs, cannot do simple arithmetic. If he was lying, then as HQ clearly states, a liar cannot be Dai. Husain Qutbuddin very dramatically poses the question: ‘how could anyone say that the Ahle Bait must have felt that they were neecha, lowly and contemptible?’ He considers anyone expressing the same to have insulted the memory of Ahle Bait and tarnished their lofty standing. If he is true, then Dawat texts demonstrate that Ahle Bait SA themselves, in their own words, have tarnished their own standing, and Hudaat Kiraam SA have continued this discourse throughout history. This of course would never be possible and this post will provide evidence why Husain Qutbuddin’s claim is incorrect. If only Fatema would look at the Fatemiyaat (the daughters of Fatema)! For they are surrounded by enemies. Among them, one shouts in grief, O brother! One exclaims, O father! One yells, O grandfather! One cries, O Sorrow! Their garbs are torn! They are anguished by the loss of their beloveds! Their hair has been unfurled; they’ve been forced to abandon the privacy of their quarters. Syedna Mu’ayyad RA has great stature among the luminaries of Fatimi literature. The use of ‘ya layta’, ‘if only’ here is exceptional. Of course Moulatona Fatema SA is looking at her daughters, but Syedna Mu’ayyad’s RA use of this literary device indicates the emotion that overcomes a Mumin in the zikr of Imam Husain SA and when narrating the tragedy of Karbala. This description of Moulatona Fatema’s SA daughters has been eternalized in Mumineen’s memory, further intensified by the use of these terms and this imagery in Syedna Taher Saifuddin’s RA marthiyah mubarakah, ‘Ya Syed al-Shohoda’ii’. He describes their persecution and the way they are made to walk with the following phrase, ‘yosaqna sawq al-imaai’: ‘made to walk in the manner of slave-girls’. O father! O, my estrangement and loneliness after you! O, my loss; O, my zillat (lowliness and contemptibleness); O, the defilement of my sanctity! Syedna Burhanuddin’s RA words are similar to an Arabic version in Agharr al-Majaalis: the compilation of bayaans prepared by Syedna Taher Saifuddin RA for wa´z during Asharah Mubarakah. Moulatona Fatema SA attributes to her own self the word zillat, meaning lowliness or baseness. She states that after the loss of Rasulullah SA and the subsequent persecution at the hands of dushmano, she has been dishonoured and humiliated. If Fatema felt this way, would not Fatemiyaat, her daughters who were treated like slaves in Karbala, their veils snatched, their heads uncovered, their men slain, feel similar? Would not her children, upon whom water that was permitted to all people and animals was forbidden, feel the way she did after the zulm carried out upon her and her family? Moulatona Fatema SA described the intensity of her lowliness with the Arabic figure of speech ‘ya’ used for exclamatory intention. She would only say what she felt. If she felt this way, and moreover declared she felt this way, why should her children, facing similar or greater persecution, not feel the same? How can anyone be criticised for attributing a sentiment experienced by Fatema when persecuted, to her daughters and granddaughters who Syedna Mu’ayyad RA has referred to as Fatemiyaat? The parallels between Moulatona Fatema SA and the Ahle Bait SA are clear and the words of Moulatona Fatema SA, Syedna Mu’ayyad RA and Syedna Mohammed Burhanuddin RA illustrate this. O the lowliness of his (Husain Imam’s SA) children, those among them whom have been made prisoners are led by Husain’s son, Ali, the imprisoned. Elsewhere in his poetry he describes the tragedy of Karbala as having disfigured the nose of Islam. The nose is considered an embodiment of respect and honour; references to the nose being disfigured in Arabic literature mean that one’s honour has been taken away from them. These examples clearly illustrate the manner by which Hudaat Kiraam RA have described the zillat, disgrace and baseness attributed to the Ahle Bait SA with respect to the great tragedy and museebat of Karbala. According to Husain Qutbuddin, such statements are sacrilegious, so why have they been made? Husain Qutbuddin goes on and on about nehj, or tradition. He very pompously claims to know exactly what Syedna Burhanuddin has and has not done. In fact, he insinuates he knows what all the Doat have done, yet he could not see the undeniable interconnection and association between Syedna Mufaddal Saifuddin’s TUS bayaan mubarak and the kalemaat nooraniyah of none other than Moulatona Fatemah SA and the other Hudaat Kiram SA mentioned above, including Syedna Mohammed Burhanuddin RA. In their desperation to level accusations of inappropriateness against the haqq na saheb, HQ and Khuzaima have now proceeded to make a mockery of a fundamental element of the Dawoodi Bohra faith: the zikr and remembrance of Imam Husain SA. Their abandonment of the haqq na saheb has resulted in their inability to recognize haqq itself. To speak of elements of Husain Imam’s SA gham in this manner: with scorn, scoff and sarcasm, is the gravest of sins. He says the Ahle Bait SA cannot be referred to or described as they were, but this description is common all throughout the history of our community, beginning with Moulatona Fatema SA herself. By abandoning Syedna Burhanuddin RA and disregarding his words, Allah Ta´ala has taken from them the greatest blessing of all: the understanding and awran of the zikr and matam of Imam Husain SA. Syedna Mohammed Burhanuddin RA, our beloved departed father, appointed his son Syedna Mufaddal Saifuddin TUS as his mansoos and our Moula after him; he did this in writing, before numerous witnesses on multiple occasions and in front of thousands of his children Mumineen. Those that deny this, deny Syedna Burhanuddin and defile his memory. 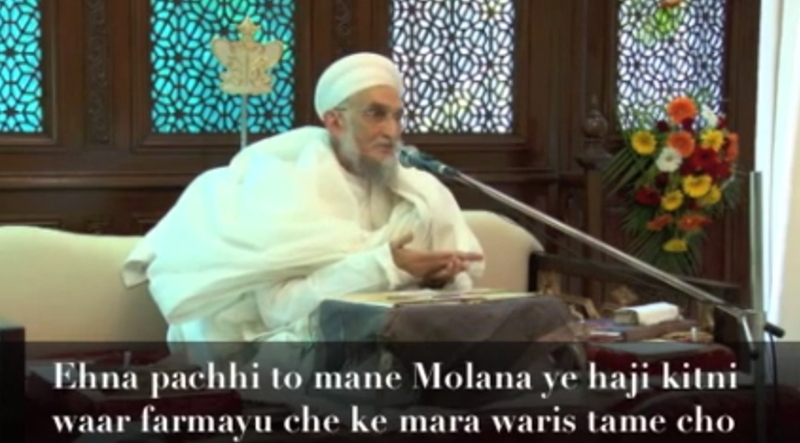 That those who follow other than Syedna Mufaddal Saifuddin TUS no longer talk about ‘khaangi nass’ and in their hours of YouTube bayaan fail to respond to a simple question regarding the translation of an Arabic sentence, is evidence that they too know the truth: that Syedna Mufaddal Saifuddin TUS is the 53rd Dai and the mansoos of Syedna Burhanuddin RA. They no longer wish to speak about nass because they cannot respond. The Q&A series on the FatemiDawat.com site attempt to address the arguments raised on this blog, but the arguments put forth here in the initial posts regarding the very foundation of their claim remain unanswered and disregarded altogether. Why? Now, in order to further distance their audience from the truth and the matters of nass which they obviously have no answers to, they’ve added yet another smokescreen: one of lies, fabrication, mockery of Dawat and ridicule for the Dai and his ‘amal mubarak. Husain Qutbuddin’s latest Q&A videos, unsurprisingly, yet again highlight his ignorance of not only Dawat texts, but Syedna Taher Saifuddin RA and Syedna Burhanuddin’s RA ‘amal and nehj. In the first waaz during Ashara 1431 H, Syedna Mohammed Burhanuddin RA stated that in following in the footsteps of his esteemed father, “Mamlook e Ale Mohammed has composed this marthiyah (Fulkul Husain), [which I presented] in the khidmat of Imam Hussain during the historic trip to Karbala (1430 H)”. The zikr of Imam Hussain AS and especially this marthiyah shareefah, encapsulates the one of the greatest legacies of Syedna Mohammed Burhanuddin RA – his deep-rooted love for Imam Hussain AS and the nurturing of that love in the hearts of Mumineen. Yet, this marthiyah, which represents what Syedna Mohammed Burhanuddin stood for and all that Imam Hussain meant to him, has been disregarded and dismissed by Khuzaima and his followers. Not once, in a single bayaan or waaz, not even during the Asharas he conducted after 1430 H did he recite a single verse from this marthiyah – not one. In fact, he and his sons stopped Mumineen from reciting it. If they wanted nothing to do with it, then at least they could have let those who loved their Moula recite Moula’s marthiyah. But they did not. Khuzaima clings on to the past, not realising that the past only holds meaning when it is understood through the present. He will recite (just as he has done in his most recent video) Ya Syeda al- Shohadaa’, but never Fulkul Hussain. He recites the marthiyah of his father but never the one of Burhanuddin Moula, who called him ‘Al-Walad al-Ahabb’ (most beloved son) three times. Is this how he shows his reverence to his spiritual father? Syedna Mohammed Burhanuddin’s every action, gesture and sentence was revered by every mumin. Khuzaima enjoys drawing parallels between himself and the great Mazoon, Syedi Abdulqadir Hakimuddin QR. However, does he know what Syedi Hakimuddin would do when receiving any correspondence from the Dai of his time? He would be waiting in earnest, anticipating the arrival of a letter or mithaal. When the letter would arrive, he would stand up in reverence, would kiss the seal of the Dai and lay the handwritten words of the Dai upon his forehead. Did he not take heed from the seerat of the eminent mazoons of the past? Taher Qutbuddin reminds us that Khuzaima would do sajda when Syedna Burhanuddin’s RA mithaal would reach him. Why is he respecting Maula’s mithaal mubarak but disrespecting his marthiyah mubarakah? It seems unfathomable why Khuzaima adamantly refuses to recite this marthiyah. Why is it so difficult for him? · Is it because he thinks it is below his stature to recite the marthiyah of the 52nd Dai Mutlaq? That would mean he sees himself above and beyond the position of Dai Mutlaq. · Is it because he believes that the marthiyah is a misrepresentation of Imam Hussain, the events of Karbala and the meaning of bukaa’ and matam? · Is he saying that he knows better how to do the zikr of Imam Hussain AS, that somehow he is better versed and better equipped for the rithaa’ of Imam Hussain? If so, then it is a direct assault on the lofty and exalted status of Syedna Mohammed Burhanuddin RA. He thinks himself superior to the Dai of his time. He is denying that the Dai is the recipient of the faiz of Panjatan, Aimmat and Duat and says and does things which have no basis in fact. It is worth keeping in mind that Syedna Mohammed Burhanuddin RA composed this marthiyah two years before his stroke, which Khuzaima claims incapacitated Moula. The reality is that even if Moula did not have a stroke and he conferred nass in such a state, it would have made no difference to Khuzaima. He would have still come up with baseless claims that he was mansoos. His rejection of this marthiyah is evidence enough that he rejected everything that Moula said and did. In the end one can only conclude that given all the facts, Khuzaima’s omission of this marthiyah from all his discourses and gatherings since 1430 H, is further evidence of his deep contempt for Syedna Mohammed Burhanuddin. Ultimately in doing so, he has denied that Syedna Mohammed Burhanuddin was the rightful recipient of the nass of Duat Mutlaqeen. For forty days after Syedna Burhanuddin’s RA passing, this marthiyah mubarakah was recited in Syedna Mufaddal Saifuddin’s TUS presence: at the side of Maula’s qabr mubarak, in sadaqallah and then during the majlis. Every single day. He knows that the single greatest eulogy to his father is the recitation of this marthiyah. It is proof of his deep-seated reverence, unflinching loyalty and uncompromising love for Syedna Mohammed Burhanuddin – something only a mansoos can have. The Khawarij were a group of people who ‘abandoned’ Amirul Mumineen SA after the battle of Siffeen and claimed that he erred in permitting men to give judgement in religious affairs. They took up the call of ‘la hukm illa li Allah ’ based off of an ayat mubarakah meaning: there is no judgement for anyone save Allah. Amirul Mumineen SA described this phrase as ‘a statement of haqq (truth) through which baatil (falsehood) is sought’. KQ and his kins’ repeated statements pertaining to the position of Mazoon are in a similar vein. They wish to describe the lofty maqaam and position of the Mazoon in order to perpetrate the greatest falsehood and baatil: that Mr Khuzaima Qutbuddin is the 53rd Dai. 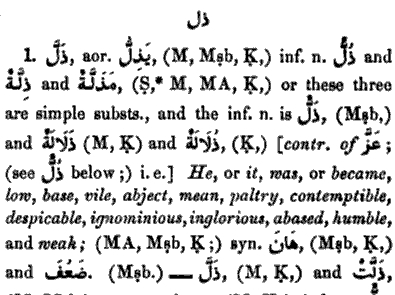 The following posts and reasons will illustrate the manner in which KQ and his kids have exploited Dawat texts and references to the Mazoon, both historically and theologically, to their own ends. As ever, they will highlight how the FatemiDawat site and the latest Q&A YouTube videos of HQ disregard key information from Dawat texts preying on people’s ignorance. Even in their press conference held a couple days ago, five minutes would not go by but they would throw references to the Mazoon’s lofty position in the face of unsuspecting and uninitiated members of the press. Even non-Bohras are victim of KQ’s constant badgering. I wish to make it clear to Mumineen that my intention is to no way lessen the importance of the position of the Mazoon. In fact, by explaining through the use of historical examples and some references to Dawat texts, I wish to separate Khuzaima and his unruly character from the position of Mazoon in the community’s collective memory so that this position can be perceived in the great maqaam that it is, untarnished by KQ’s lies and treachery. Qutbuddin Mola accepted Burhanuddin Mola’s decision to close the matter, and has NEVER spoken of it until today, when he has to do so in order to defend Burhanuddin Mola’s Dawat. Despite the evidence he had been presented with, Qutbuddin Mola even went to the Heptullah’s home for ziyafat in Nairobi after the ‘faislo’ was given in Burhanpur—this is sure proof of Qutbuddin Mola’s deep ikhlaas. The words ‘until today’ are a lie. Many people will testify as to how Khuzaima repeatedly referred to the Africa incident. Khuzaima has been harbouring a deep resentment of Syedna Mohammed Burhanuddin’s judgement of 1409H for the past 26 years and has taken every opportunity to express that while he festered in this shadows. It has been eating away at him for decades and this bitterness has spilled over in his claim to the seat of Dawat. As the statements of the website show and in the use of quotations for the word ‘faislo’ which Moula himself used, he has made it amply clear that he has never accepted Moula’s fasal. How are Khuzaima’s reservations and objection to Moula’s judgement different from that of Ibn ul Khuwaisara? Did not Moula explicitly state that he had unequivocally passed judgement and if anyone opposed it, it was tantamount to questioning his own authority? Regarding giving false witness, Rasulullah SA has said: If you obtain from me a wrong judgment/faisla in your favor by giving false witness, then know that I am giving you a seat in hellfire (Bayaan from the Rasail Ikhwan us Safa of Imam Ahmad al-Mastoor). There is absolutely no mention of a ‘false witness’ anywhere in the hadeeth. · Secondly his version should take precedence and should have outweighed all other accounts. Khuzaima also refers to the example of the man who was falsely accused of stealing. Rasulullah ordered the severing of his hands at which point it was revealed by divine intervention to Rasulullah that the man was innocent and through a miracle, Rasulullah rejoined his hands. Khuzaima has failed to understand the subtext of this case. Instead, he is implying that Rasulullah was prone to errors in judgement. This is a gross and unacceptable understanding of Rasulullah’s exalted position. There is ‘hikmat’ in his every action and decision, just as is the case with every Imam and his Dai. · Firstly, the individual in question made a false statement. · Secondly, when he was notified by no other than Imam Qaim that the facts proved he gave a false testimony, he rejected the idea. · Thirdly, he went as far as to suggest that the informant of Imam Qaim (in this case, his mansoos Imam Mansur) should not remain a trusted source and instead his account be considered accurate. · Finally, he questioned the authority of the Imam as one who received the Ilhaam of Allah. Syedna al Qadi al Noman clarifies further that the reason for the execution of the accused was not that a false testimony was made. In fact, there was another reason (which Imam Qaim was privy to) which justified his execution. Khuzaima’s actions bear a strong resemblance to this case. He has rejected the testimony of those who were trusted witnesses as recognised by Syedna Mohammed Burhanuddin. He has gone further and implied Moula was falsely led to pass a faulty judgement. Let us suppose for arguments sake, that someone did present a false testimony to Moula, does it not behove Khuzaima to understand that Imam ul Zaman would have done Ilhaam accordingly and let Moula know? In the case (which Khuzaima refers to) of the one whose hands were severed on order of Rasulullah, it was because of the Faiz of Allah and the assistance of his angels, that Rasulullah came to know of the accused individual’s innocence. Imam ul Zaman would have immediately let Moula know of the truth of the events. Khuzaima is still convinced till this very day, that Moula was wrong in accepting the testimony of trusted witnesses. In fact, it is this very conviction that testifies to Khuzaima’s resentment, disrespect and outright rejection of Syedna Mohammed Burhanuddin’s status as Dai Mutlaq. The events of Africa in 1409H are true. Syedna Mohammed Burhanuddin’s judgement, decision and unequivocal bayaan are proof enough. No matter how hard he strives to blanket the truth, light will always shine through the darkness. A number of salient points are evident. In whatever transpired in Africa, Khuzaima was misled. He was gullible and impressionable in being led astray by those who were less than trustworthy. In fact these people were referred to as ‘munafeqeen’ by Syedna Mohammed BurhanuddinRA. He lacked good judgement and believed – with wholehearted conviction (yaqeen) – that those who were innocent and wrongly accused were guilty. He lacked the ability to discern between right and wrong, and instead gave into his own emotions. How many other instances have there been where Khuzaima has given into temptation, lacked clarity of judgement, been convinced of his own assumptions and communicated with munafeqeen and consequently been mislead? There are innumerable accounts of Khuzaima’s shortcomings, mistakes, instances of disrespect for the Dai and moments of questioning his authority. However, rather than list these – which again the Khuzaima camp will dismiss as fabrications – I have merely highlighted what is crystal clear in the bayaan mubarak of Syedna Mohammed BurhanuddinRA. If they wish to refute the above, then doing so is the refutation of the words of Haqq na Saheb, and they are contesting the very institution of Wali ullah. Let them do so at their own peril.